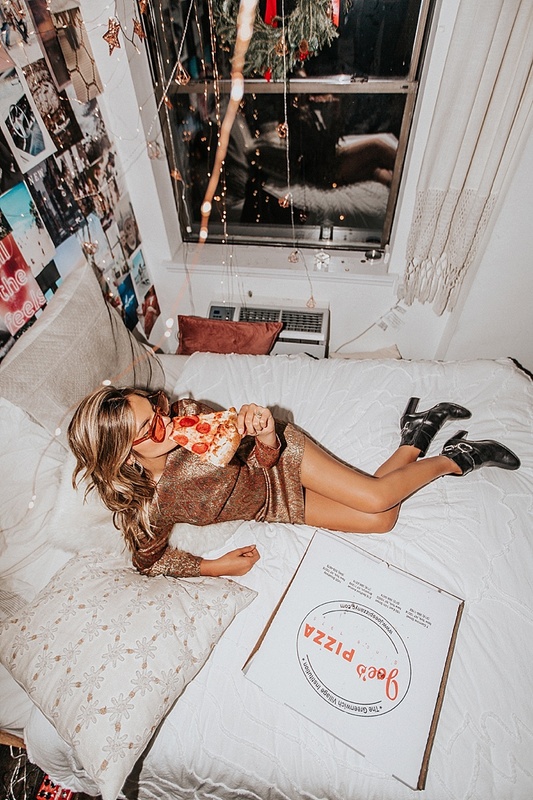 It was Saturday night, we got all dressed up ... and all I wanted to do was order a pizza, Netflix and chill, so that's exactly what we did! Let me tell you, it was one of the most fun nights I have had in a while. There is something magical about a NYC pizza. You can get a dollar slice and it still tastes like one of the best slices of pizza you have ever had! Since we moved here I have had my fair share of NYC pizza and I have to say, Joe's is one of THE BEST. . . and they know it haha! Isn't pizza one of those foods that just never disappoints, even when it's bad it's still pretty good! I picked up this dress at Express earlier in the week and it was one of those pieces you find that just gets you excited to dress up! It's the kind of dress and (you might not believe me on this) but that looks good on everyone. The kind of fabric that hugs all the right places hides the places you don't want it to all the same time. I love a brand that makes their pieces true to size. I find everything at express fits perfectly and seems to be a running classic and go to in my closet, something that always works. What's your favorite date night? Where do you like to go, what do you like to do and who do you like to do it with?